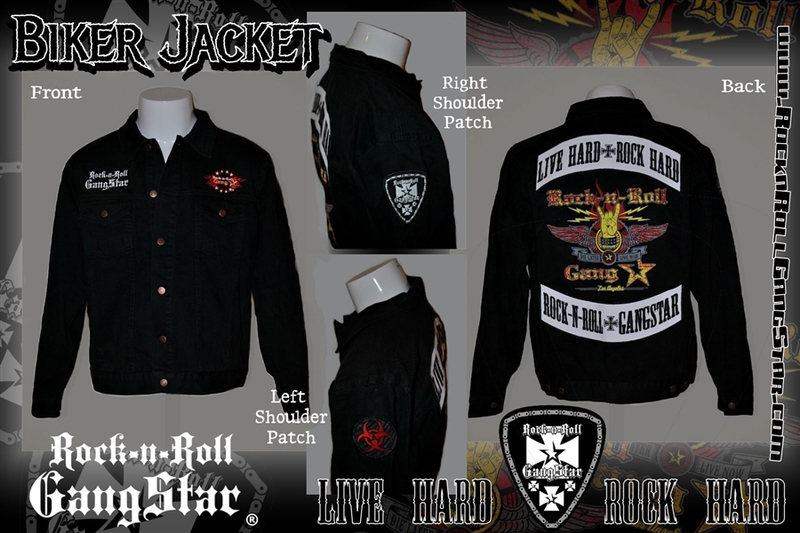 *****OUT OF STOCK***** Black denim biker jacket with "Rock-n-Roll GangStar" logos embroidered over front left & right pocket areas. Right shoulder has Rock-n-Roll GangStar biker patch, left shoulder has Biohazard patch. Back of jacket features "Rebel Emblem" artwork with slogan "Die Later. 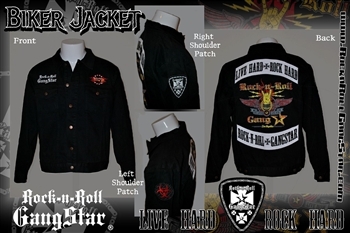 Live Now", Rocker patch "LIVE HARD - ROCK HARD" on top, "ROCK-N-ROLL GANGSTAR" rocker patch on bottom. All patches are sewn on to jacket. An awesome jacket at a great price! 100% cotton.